The Mano-de-piedra is relatively the stoutest of the large pit vipers of South America. The name comes from its resemblance to the stone implement used in crushing corn, These snakes show pattern polymorphism, some specimens being uniformly colored while others from the same litter are banded in various shades of brown. The snake is also called “jumping viper” because of the force with which it strikes at disturbers. 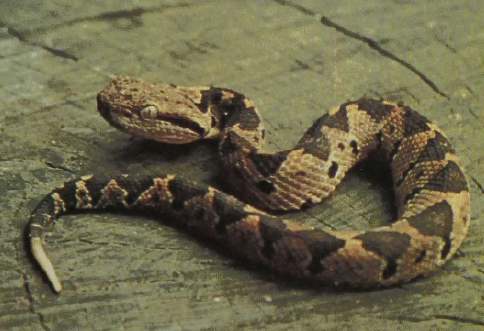 Reports indicate that it may actually propel itself Into the air for an inch or two; certainly the strike may cause the snake to slide along the ground for a short distance, thus effectively increasing the defense radius of this short, but highly poisonous, animal, which rarely reaches 3 feet In length.